Some of Kyoto’s residents aren’t really much for conversation, but that doesn’t mean they haven’t got a story to tell. How about we introduce you to a few of them? Read on for some information about some of the more interesting statues and figures you might pass on your journey through the old capital! 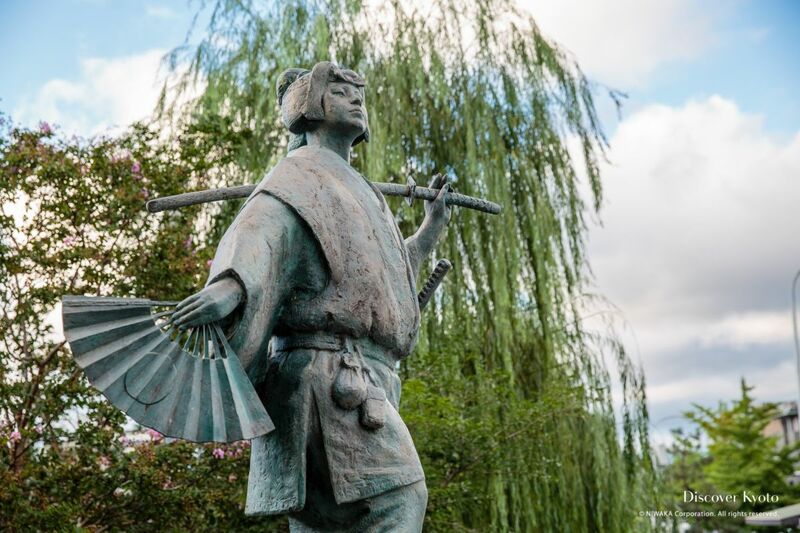 Where the Shijō Bridge crosses the Kamogawa River, just outside exit 3 of Gion-Shijō Station is a statue that could easily be mistaken for that of a young samurai warrior, confidently swaggering back from a victory. With his sword slung casually across over his shoulder, he cuts quite a dash. Except HE doesn’t cut anything. This is the entertainer Izumo no Okuni, and SHE is the inventor of kabuki, the still popular form of Japanese theatre. As a shrine maiden (miko) of the Izumo Shrine she came to Kyoto to solicit funds for the shrine, and it was on a dry riverbed where she gathered the female outcasts of the city and formed the first kabuki troupe around the year 1603. Reactions were mixed, viewing the troupe as colourful and exciting or loud and cacophonous, but she found patronage for her art and continued to develop kabuki until her retirement and disappearance from public life in 1610. 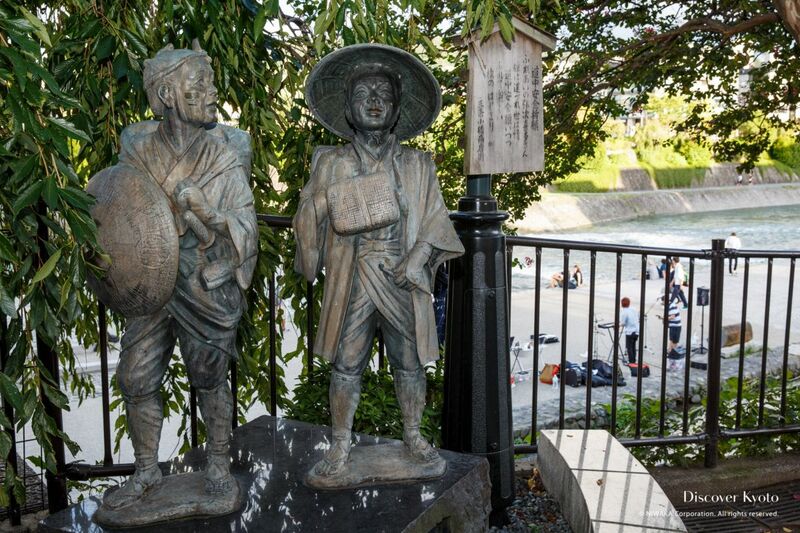 These two “characters” partially hidden by a weeping cherry tree at the western end of the Sanjō Bridge are often the first friendly face visitors to the nightlife area of Pontochō and Kiyamachi meet. Sunday morning often finds them with a few empty bottles at their feet and cigarettes hanging from their lips! But their popularity and Kyoto’s law abiding denizens keep them from any serious harm by revelers. Yaji and Kita are the two leads in the 1927 silent film “Yaji and Kita: Yasuda's Rescue” (Yajikita Sonnō Maki). A comedy piece which spawned two sequels, this film cast well-known silent film era stars Denjiro Okochi as Kita and Goro Kawabe as Yaji. Unfortunately, only a 15 minute fragment of the slapstick original exists, with the third instalment alone still preserved in its entirety. 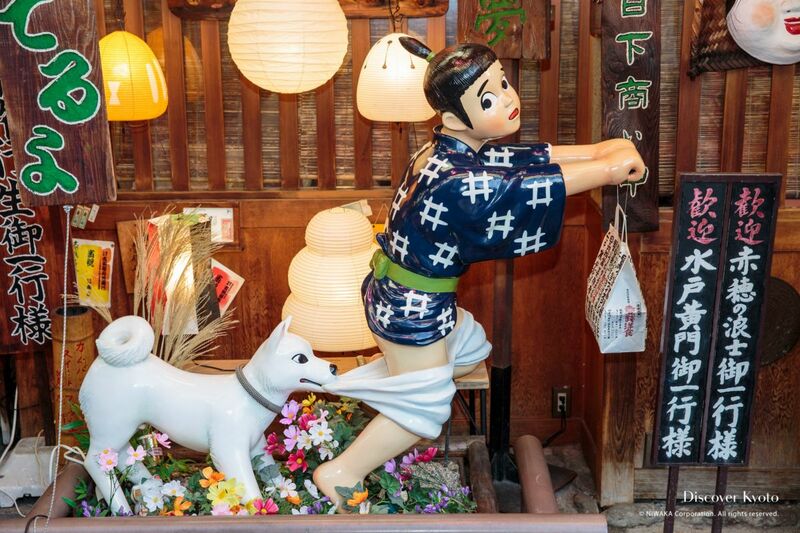 Outside Sanjō Station is a large statue of a man often referred to as “the dogeza statue”. Dogeza is a type of a kneeling bow only used in the most serious of apology situations, and at first glance we can see how it might look like that… but this fellow is actually bowing deeply in the direction of the Kyoto Imperial Palace for a reason! Takayama Hikokuro (1747-1793) was a samurai of the Edo period whose travels around the country are covered in his much studied travel diaries, but it is his unswerving loyalty to the emperor that is characterised in this statue. After arriving in Kyoto from his birth place in what is now Gunma Prefecture, he was so taken aback by the Imperial Palace’s dilapidated state that he then and there bowed deeply to it. His advocacy for the restoration of imperial rule over the then-rule of the Tokugawa shogunate earned him a good deal of respect from the imperialist faction that eventually restored the Emperor to power, erecting this statue in his honour in 1868. 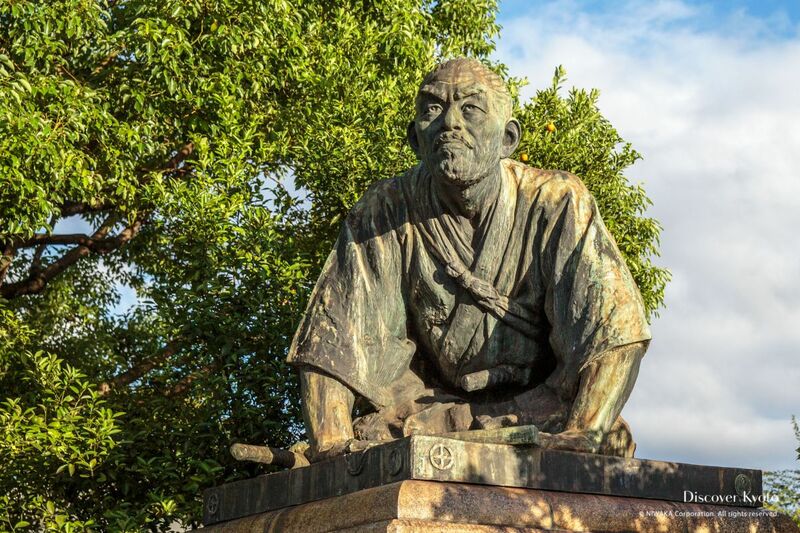 This is a statue of Ryōma Sakamoto (1836 – 1867), a famous figure originally from Kōchi prefecture who played a large part in the tumultuous Bakumatsu period. A popular fellow, his image can be seen in various locations around Kyoto. Aligned against the shogun-led bakufu government, he admired certain aspects of Westernization, espoused modernizing the military, and was instrumental in unifying pro-Imperial domains to stand against the bakufu. Surviving several assassination attempts in Kyoto, he sadly met his end before seeing his dream of political change realized. Ryōma was killed at the Ōmiya Inn on Kawaramachi Street alongside his comrade Nakaoka Shintaro (depicted on one knee in this statue) at the hands of assassins likely aligned with the Tokugawa shogunate. Although someone was sentenced and executed for the murder, the true identity of the killers remains unknown to this day. 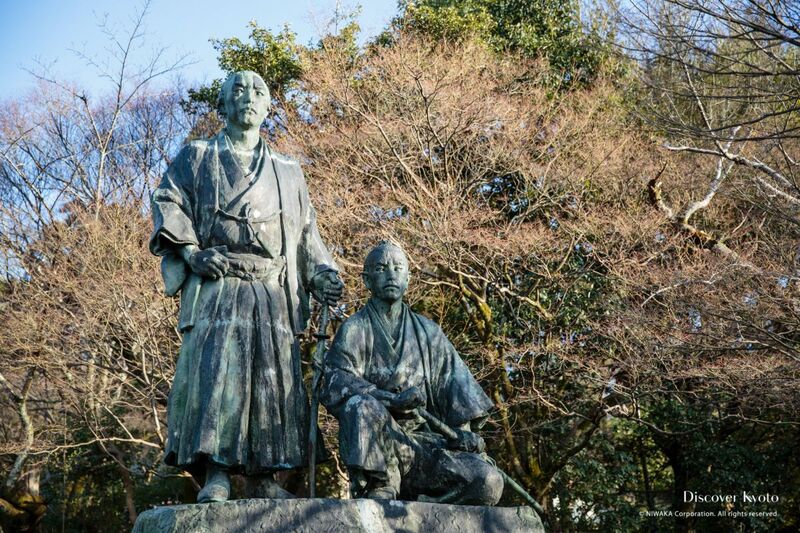 His contribution to modern Japanese politics and military (especially the Imperial Japanese Navy), along with his early, dramatic death has cemented his place as one of Kyoto’s favourite adopted sons. The big fellow is Benkei, and the nimble chap is Minamoto no Yoshitsune, a famous pair in Japanese history… though they were both already legendary before they teamed up. Virtuous warrior nobleman Yoshitsune, called Ushikawamaru in his youth, was taught swordsmanship by the king of the tengu (mountain goblin) on Mt. Kurama in the north of Kyoto before later teaming up with his elder brothers to revenge their father’s death. 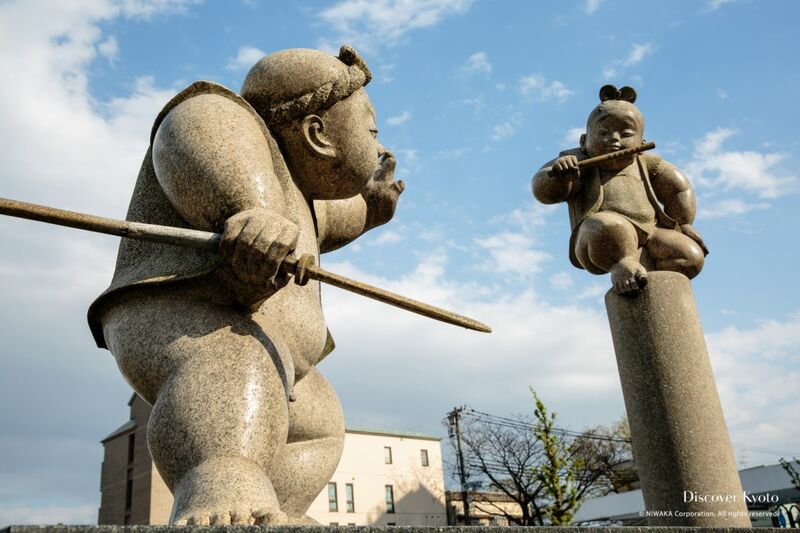 Benkei had several adventures under the childhood name of Oniwaka (Ogre Child), and seeking strong opponents had posted himself at Gojō Bridge in Kyoto challenging and disarming every swordsman that tried to cross. He had 999 swords in his collection when Yoshitsune turned up. After being defeated by the swift and intelligent youth, Benkei became Yoshitsune’s most loyal retainer, fighting alongside him through war and betrayal until their deaths at the Siege of Koromogawa. This statue is a rather cute portrayal of their meeting, charmingly placed at the Gojō Bridge where it is said to have occurred. 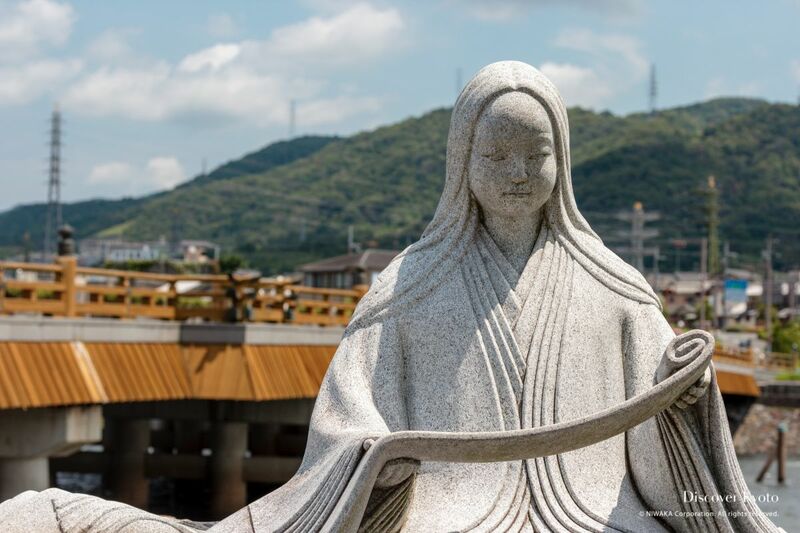 This petite Heian period lady in the long flowing robes and hair is actually a giant of both Japanese and world literature, often credited with writing the world’s first novel. Known to history by her nickname used at the imperial court, Murasaki Shikibu (c. 973 or 978 – c. 1014 or 1031) was a Japanese novelist, poet and lady-in-waiting in the court of Empress Shōshi whose real name may have been Fujiwara no Takako. Her novel, The Tale of Genji, details the life and loves of the eponymous Prince Genji during the height of the Heian period and is still very popular today. There have been numerous manga, films, anime, musicals, and even an opera made of it! The second half of The Tale of Genji takes place in Uji, continuing the story after Prince Genji’s death through his grandson and grandnephew/stepson, and in honour of this connection you can find the novelist perched beneath a lone pine alongside the famous Uji Bridge.